Stories of the past intrigue most of us, and we learn so much about our ancestors this way. Antiquing or rummaging through estate sales are a favorite Saturday morning pastime for many. Historical sites continue to be popular with all ages, and history-related television channels have a faithful following. Benjamin Franklin’s two apprentices in Liberty’s Kids, shown on PBS, are now on Facebook. Reruns of Braveheart and Downton Abbey are readily available, and historical fiction continues to bring history alive. The National Society of Daughters of the American Revolution gained over 13,000 new members last year; these are women who can trace their ancestry back to the Revolutionary War. Over the past several years, book signings in Bethabara and Old Salem have opened my heart to a culture that I was not familiar with. Visits there have offered me a tangible link to the colonial history of North Carolina, where many of the buildings are original to the town established in 1753. The Moravian church had its beginning in the country now known as the Czech Republic in 1457 and is known as the oldest Protestant Church. They formed the “unity of the Bretheren” and followed Jan Hus who was martyred for his faith in 1415. The early Moravians were a gentle people who trusted the defense of their beliefs to their faith rather than to walls or military battles. Members agreed to accept the Bible as their only standard of faith and to practice a code of behavior based on the principles of simplicity, purity, and brotherly love. The first love feast was held on August 13, 1727. It was created to make the community of faith more like the church of the New Testament. It was an Agape meal among the followers, held either at the breakfast or the dinner hour. It was a simple meal, but still a meal. It does not and did not take the place of the sacrament of Communion. This custom became a tradition to celebrate a special occasion. In the 18th and 19th centuries, they often held as many as 50 or more a year. They celebrated festival days, honored distinguished guests, recognized milestones such as birthdays, bid a last farewell to neighbors moving away, or to bind unity in the congregation. Today Christmas and Easter are the more usual times. One year in Bethlehem, Pennsylvania, the first Moravian community in the United States, they held 250 love feasts. There was no set menu in older days. At least one love feast in North Carolina consisted of pumpkin mush, but generally there was a sweet roll, which was to remind the worshipers of the sweetness of faith. The beverage was usually tea, which is still the case in most European congregations. For Christmas, our Moravian ancestors sometimes had spiced wine or hot chocolate. All of the sweet rolls would be home made, according to family recipes. In the 18th century, individuals in a congregation might volunteer to provide a love feast for the congregation or a smaller group, such as the Single Brothers. The people in charge of the love feast would provide the food and beverage and arrange for special music. Giving a love feast was a type of stewardship and a way to serve the congregation. It was about building unity. In the Moravian Church, there is a special corps of servers called “dieners” (German for serve), whose responsibility it is to distribute the buns and mugs of coffee, prepared well in advance so that there is no interruption to the flow of a service. The dieners sometimes wear special uniforms, the women in white with a white doily on the head, and the men with a long white apron wrapped about them. Buns are passed along the pews in baskets, each person taking a bun and passing the basket on. The mugs of coffee are carried on a tray and passed hand-to-hand by the occupants of the pews. Usually men carry the trays, while women take care of passing the mugs to the pew occupants. All of the serving activity, and the collecting of the mugs after the partaking, take place while the hymns are being sung. In a well-run love feast, the buns and coffee are distributed almost without being noticed by most of the congregation. Today the love feast meal is still simple, and elaborate trappings are not needed. The usual food is a sweetened bun, sometimes placed on a paper napkin. Any kind of pastry can be used if it does not produce dust, crumbs, or stickiness. Sweet, creamy coffee is the usual hot beverage. The Moravians left Herrnhut, Germany, in 1733. They came to settle new Moravian communities and become missionaries to the Indians. It is interesting that John Wesley, the cofounder of the Methodist Church with his brother Charles, sailed with them and was influenced by their faith, joy, and practice of love feasts. This pilgrim group celebrated their safe journey with a love feast when they arrived in Savannah, Georgia. The oppressive climate and tension with the Spanish in Georgia led the group to consider moving to Pennsylvania, a colony known for its rich natural resources and extraordinary toleration of ideas. By 1741, they had purchased a 500-acre tract of land north of Philadelphia, along the Lehigh River. Once again, they celebrated their arrival with a love feast. The Moravians organized and built the religious communal society of Bethlehem. Although the settlement began with fewer than 20 people, the population grew to several hundred by the 1750’s. The Pennsylvania Moravians felt called to start a new settlement. On November 17, 1753, fifteen weary men and a wagon load of supplies arrived at a deserted cabin in the western part of North Carolina in what is today Forsyth County. The group had been six weeks on a journey walking from Bethlehem, Pennsylvania on the Great Philadelphia Wagon Road. On arrival, they celebrated their love feast with cornbread. Their task was to break ground in the wilderness for a new colony of their church; they named it Bethabara, a Hebrew name meaning “house of passage.” This was to be a temporary town before the settlement of Salem. Visitors in Bethabara today can view the reconstructed 1759 community garden, the only known, well-documented colonial community garden in the United States. Along with raising their food, these Moravian pioneers were organized and industrious; they were carefully selected for their skills and talents. Gardening was essential for seasonal foods, as well as preserving for winter. Today in Old Salem, you can visit traditional Moravian gardens and see the produce they raised. The original home of Matthew Miksch can be toured; he was trained in Europe as a Master Gardner and brought his expertise to Salem. Using raised beds as planters and grafting fruit trees. Onions, potatoes, asparagus, carrots, pumpkins, and cabbage were plentiful. 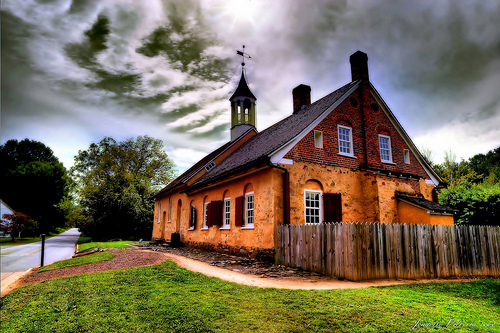 The Historic Town of Salem is a living history site that covers a large period of time, telling the story of Moravians establishing a town, and that town’s growth through the 18th and 19th centuries. One of the easiest ways for the modern visitor to gain an understanding of the past is through historic cooking and baking preservation. Costumed interpreters learn how to cook, bake, and preserve food; this requires quite a bit of research and practice. Primary sources teach understanding about what types of food were used, the common ways to prepare and flavor them, and how to cook and bake on an open hearth. The Moravians encouraged keeping diaries and journals, and some people would often include meals enjoyed, or daily household activities such as preserving, so information is still available today. Winkler’s Bakery still uses recipes and methods from 18th century —raisin bread, hot cross buns baked at Easter, sugar cakes, love feast buns, similar to hamburger buns but sweet. The dome bake oven is original to 1800, and it is heated still with wood. Up and down the street, the smells of fresh baked goods lure visitors to this site. The Moravians brought to North Carolina their strong system of community life. In the original Wachovia settlements, property was held in common and settlers drew on community stores for food, tools, and other supplies. Pooling their labor and resources allowed for rapid settlement based on an economy of agriculture and trade e.g. pottery, blacksmithing, woodcarving, etc. Moravians have maintained the heritage of a distinctive way of life into modern time. There is something unique to eating during a church service. It is not unusual to see babies given bottles or children candy. When all members of the congregation participate in a food event, unity and harmony are immediate. Today a love feast might be conducted for a cancer ward. The last day of Vacation Bible School could celebrate with a love feast. In Spartanburg, South Carolina, there is a love feast celebrated each Christmas season at the First Presbyterian Church, led by their choir, but the food is served by Moravian dieners from a local Moravian congregation. Wake Forest University celebrates a love feast on the first Sunday in December. It was organized by a Moravian student in December, 1965. There were two hundred students at the first observance, but numbers have grown each year. Now it is the largest Moravian love feast in North America. 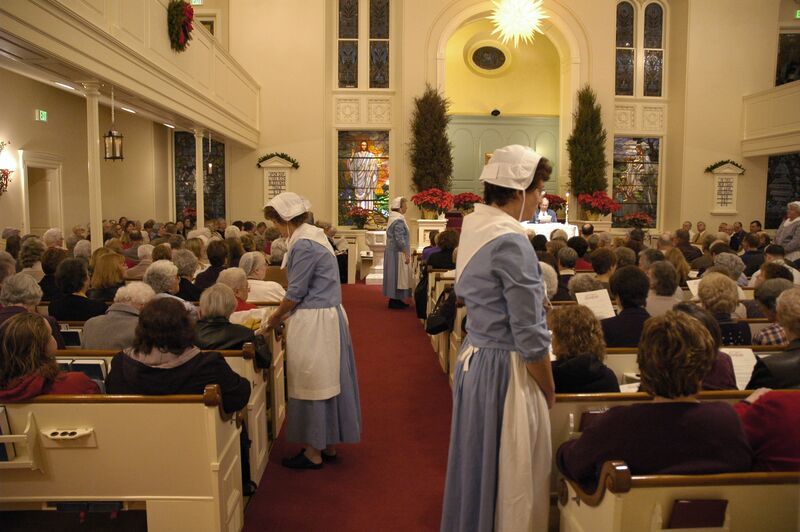 In Old Salem each year, the Women’s Fellowship of Home Moravian Church presents a Candle Tea in the Single Brothers’ House. This traditional love feast includes hot, creamy, sweet coffee and sugar cake baked at Winkler’s Bakery. There is a time of singing Christmas carols to the playing of a 1797 Tannenburg organ. Each participant receives a beeswax candle, surrounded by red crepe paper and handmade on site. Even among strangers, shared food, fellowship, and music produce a closeness that we recognize and hunger for as individuals. We savor our times of community, and a Moravian Love Feast is a feast for the soul that includes a cup of coffee in church! Posted in Uncategorized and tagged Bethabara, Candle Tea, Moravian Love Feast, Old Salem, sugar cake, Wake Forest, Winkler's Bakery. Bookmark the permalink.